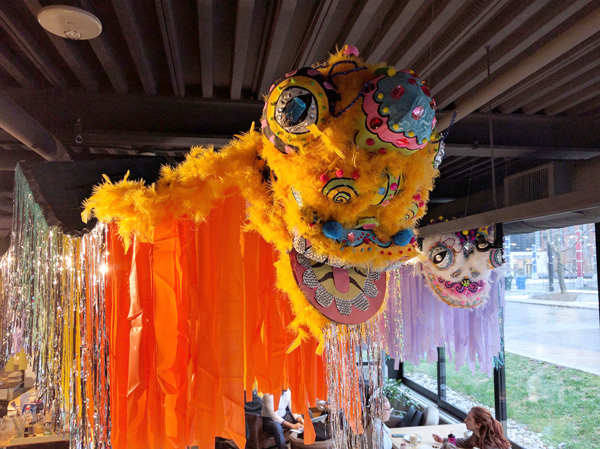 The Theatre Centre is excited to present Dancing With Dragons by Paddy Leung, as part of SIDE STREETS, a year-round series of hanging installations in The Theatre Centre Café/Bar, curated by Kalpna Patel and created by the talented and local artists of City of Craft. Toronto-based multidisciplinary artist, Paddy Leung, is a fairy of all traits that can make all your most magical dreams come true! Using paper, glitter, streamers, bling, and confetti, Paddy recreates her own hopeful, imaginative world. Her large-scale, whimsical installations allow the audience a peek into Paddy’s imagination. Paddy is also known for hosting themed events and workshops, interacting with Toronto’s vibrant art community, and the city as a whole. Born in the year of the dragon, Paddy introduces Dancing With Dragons as her visual interpretation of the Chinese tradition by integrating western pop culture influences. Paddy’s latest creation is heavily inspired by The Lion Dance, also known as The Chinese Dragon Dance. Traditionally, the lions’ costumes are composed of beautiful and colourful textiles.The lion’s head (mask) is usually oversized and dragon-like, followed by a long silky colourful textile that extends to the lion’s body.­­­­­ The Dragon Dance is often performed during Chinese New Year and other Chinese traditional, cultural, and religious festivals. The dance is thought to bring good luck and is an integral part of many important occasions such as weddings ceremonies, and business opening events. With their inclusion in this year’s City of Craft, Paddy hopes the dragons will bring good luck and magic to all that see them! Check out her spectacular Dancing With Dragons shimmering at The Theatre Centre Café/Bar until February 2017! Click here to read the Q & A with Paddy, conducted by Sarah Febbraro, Nicole Collins, and Myung-Sun Kim. Stay tuned for Paddy’s Chinese New Year special edition community meal and a workshop at The Theatre Centre in January, 2017!